Summary: Very useful for reference while producing graphs, and very comprehensive (including heat-maps, 3D graphs and maps). As a scientist I often need to plot graphs of my data, so I am keen to learn more about how to do this in various languages. I tend to use R for most of my statistical analysis, so plotting graphs in R is something that I often need to do. 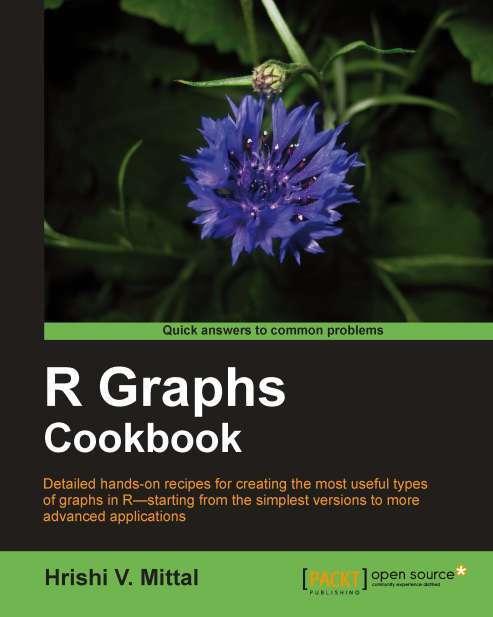 I have a bit of knowledge about R already (mainly gained from the books that I have previous reviewed about R), and looked to this book to explain more about graphing in R. As stated in the title it is a ‘cookbook’ – a type of technical book that provides a number of ‘recipes’ for performing various tasks, and this is both one of the main advantages and main disadvantages of this book. I generally have a love-hate relationship with these ‘cookbook’-style books – I find them useful when wanting a quick answer to something, but I am slightly concerned about the manner in which the teaching/learning takes place. These books can be very useful, as the cookbook style allows the reader to very quickly learn how to do something which they need to do, but this learning does not always take place within a context which allows the reader to understand why they are doing what they are doing. For example, in a book like this, the reader could be told exactly what commands to type to plot a line graph – but they may not actually learn anything about what each of these commands do, and how to adjust them if they need to do something very slightly different. However, I am pleased to say that this book is actually very good. It starts with an overview chapter that contains basic recipes for plotting various types of graphs (all of which are covered in greater detail later on in the book) as well as exporting the graphs to be used in other documents. Then comes one of the most important chapters – a detailed explanation of the par() command for adjusting parameters such as margins, colours, fonts and styles. Again, this is presented in ‘recipe’ form (of which more below) which again is a double-edged sword: it makes it easy to find the parameter setting you’re looking for, but harder to get an overview of the range of different parameters you can set. A simple table at the end of this chapter listing the parameters and the possible options for each of them would have been very useful – but was sadly not included. The rest of the book goes through a number of types of graph, providing detailed recipes for creating them. They start with the most important types of plot: scatter graphs and line graphs (with a helpful emphasis on plotting time-series data with sensible axes labels) before moving on to bar charts, pie charts, histograms and box and whisker plots. All of this would be expected in a book on graphing software – however, this book goes further by providing a section on heat-maps and contour plots, and then a section on creating maps. The heat-maps section is particularly interesting, and I can see a number of applications of the example visualisations they have provided. The book then closes with a chapter on exporting graphs for display – both to raster and vector formats. As mentioned already, all of the information is provided in the form of ‘recipes’, which have a standard format of: introduction, getting ready, how to do it, how it works…, there’s more… and see also. This tends to work well for most parts of the book – with the introduction explaining the type of graph and why you might want to use it, getting ready showing you how to load the required libraries, how to do it providing code and how it works explaining the code, with more options being explained in there’s more and see also. However, this falls down slightly when dealing with topics that require a little more explanation – such as the section on exporting graphics for publication, which could really do with having a more detailed section on the difference between raster and vector output, and how to choose between them. The book generally choses sensible datasets to plot for each graph, although at times the code is made unnecessarily confusing by adding lots of code to download datasets via web APIs (useful to be able to do, but perhaps not hugely relevant to the topic of this book). Apart from this, the code is generally well written, although some extra comments in the code might have been helpful – as it would save me constantly referencing between the how to do it and how it works sections. Overall, I will definitely keep this book on my shelf as a handy reference for when I need to create a graph quickly in R, although I would recommend combining this book with another book (for example R in a Nutshell) for more details on the graphing functions and the rest of R.
Robin, thanks very much for the review. I’m really pleased to know that you found the book useful. I’ve noted the shortcomings you point out and will try to address them on my blog.